Sometimes I find myself following a diagram of sorts when I start a page. A design that I've done over and over again comes naturally, but sometimes I get bored. That's when I know it's time to shake things up. 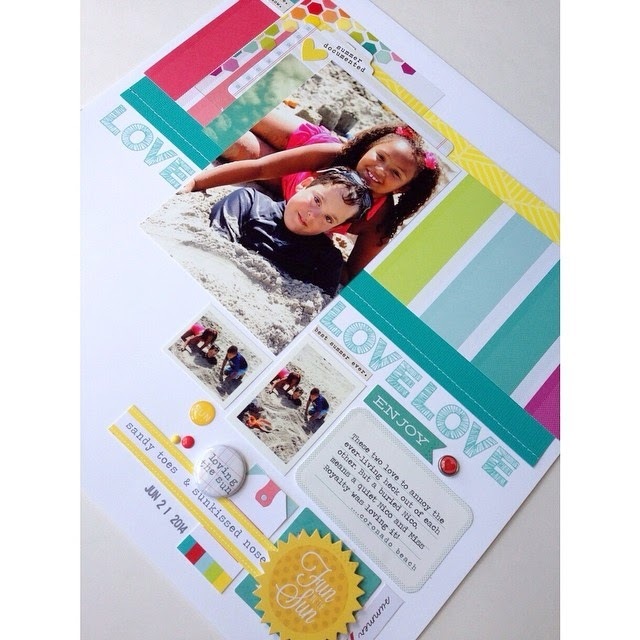 Creating on a diagonal line is not new, I've seen it all over Pinterest. But it's new to me and it was a challenge to put my own spin on it. 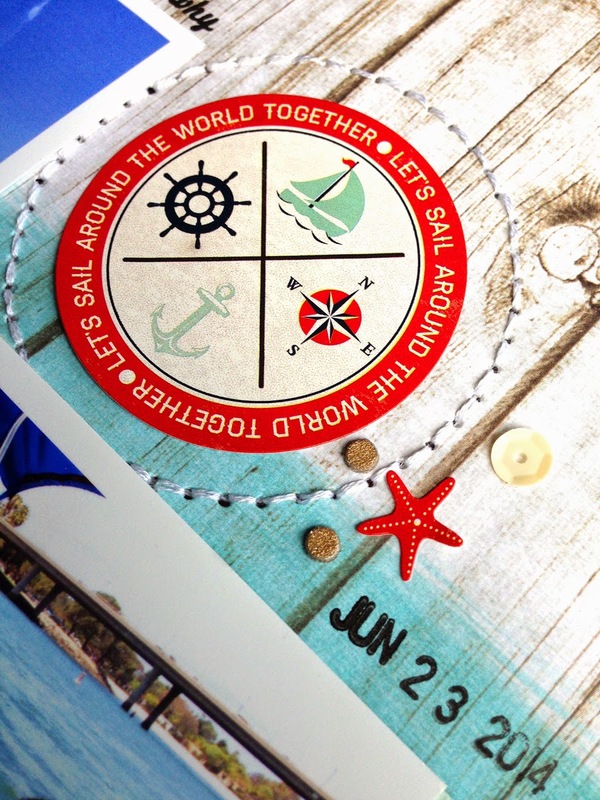 I kept super clean lines, bright colors and a line of stamping to make it my own. This corner cluster started with the two small photos and then I just kept building out until I reach the corner of the page. I continued the layer on the opposite side with larger pieces. 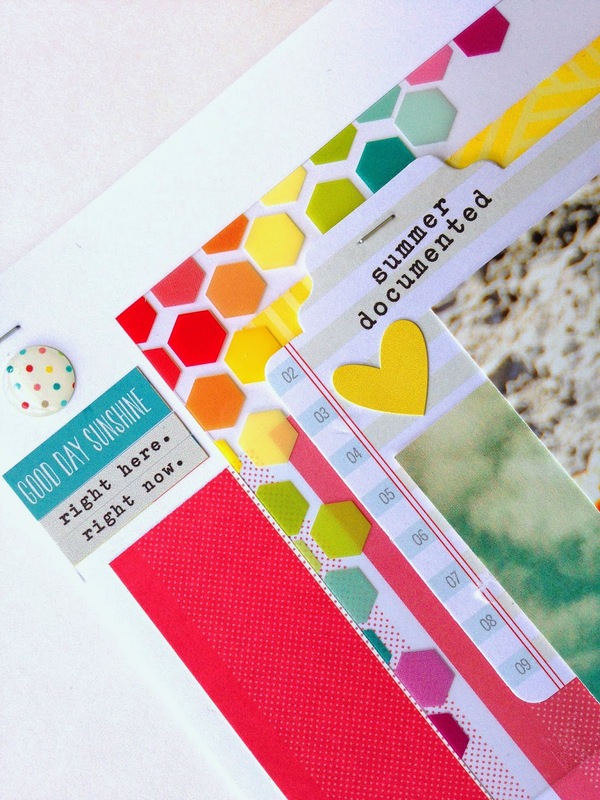 My favorite is this colorful, hexagon print transparency from American Crafts. 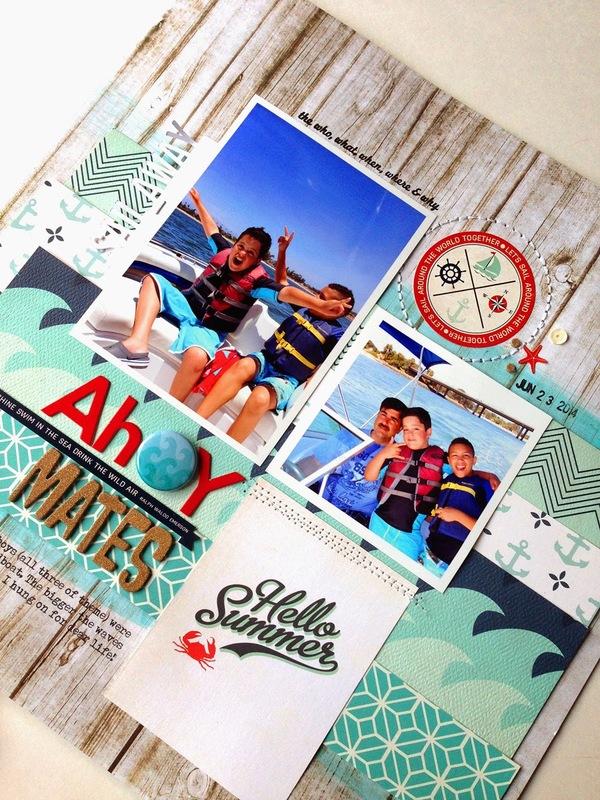 I've gotten so many ideas and pages from the Scraptastic's July Sail kit. I'm not sure if it's the cool nautical vibe or the fact that I'm desperately trying to hang on to what's left of summer. It seems like we just came back from California and I love looking back at these pictures. One of our favorite days was a very laid back afternoon on Mission Bay. The kids chose to rent a speedboat instead of going to the zoo. I think they were all theme parked out. I love everything about this sticker (the colors, the icons, the text) and I was determined to work it into the design. Adding a circle of handstitching and some random stickers, sequins and a date stamp give some lift to the flatness of it. 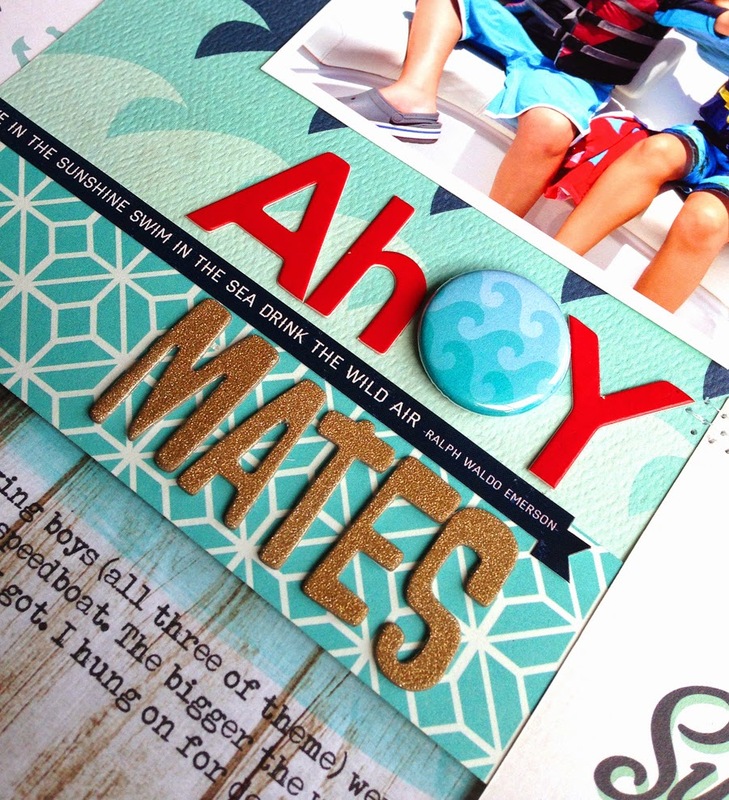 Layers of patterned paper gave me a pop of turquoise and a shelf to put the title on. I used a little swipe of turquoise paint on the white wood background to soften the edges of the linear design. This page speaks to me. 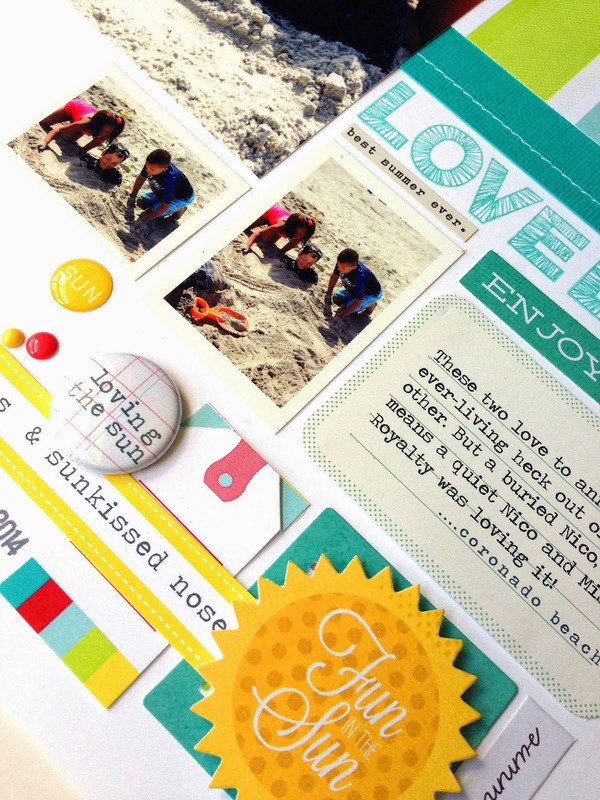 It highlights pictures that make me smile, a good memory and pretty layers of paper. It doesn't get better than that for me!